Ted: "Strange things are afoot at the Circle K."
I watched this movie religiously as a kid. It became the first movie of my young life that I could quote from beginning to end without missing a beat. In fact, I even learned how to play most of the soundtrack on the guitar. That's how much I loved this movie. In 1988, Bill S. Preston "Esquire" and Ted Theodore Logan are dim-witted students at San Dimas High School whose only dream is to have a most triumphant rock band ("Wild Stallions"). But the band is going nowhere because, while they practice a lot, neither of them actually know how to play an instrument. And as for their high school career, they are destined to "flunk most heinously" unless they get an A+ on their oral History report. If they flunk out of school, Ted's father will send him to Alaska for military school, which would be the end of the band- and, as it turns out, the end of world civilization as we know it today in 2688. While Bill and Ted are still contemplating the most "non-triumphant" possibility of flunking out of school and losing their band, Rufus (2688/present day) is getting into a time-traveling phone booth to begin his journey back to 1988. There he will help Bill and Ted get an A+ on their report and thus save the world as he knows it. If the band falls apart, the basis of their whole culture in 2688 will be lost (perhaps similar to America without the historical influence of Greece). 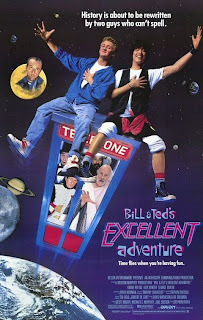 Only hours before their report, Bill and Ted travel back in time to capture "personages of historical significance," including Abraham Lincoln, Beethoven, Genghis Khan, Napoleon, Joan of Arc, Sigmund Freud, Billy the Kid, and Socrates (pronounced "Soh-craytes"). Each of these figures from history speak in Bill and Ted's oral report, earning them an A+ and a second chance to make their own history through the music of Wild Stallions. It's a ridiculous movie even in its day, but it's good fun nonetheless. Dude... you were my Bill and Ted's mentor. In fact, I even took on their identity. I life change. All I can say is... thanks! One thing, isn't Wild Stalions spelled with a "y". Like Wyld or even Wylde Stallions? Yes, Bill, I think it is "Wyld" but I was too lazy to go back to the movie to verify a correct spelling.